And now, I would ask of you, my beloved brethren, wherein the Lamb of God did fulfil all righteousness in being baptized by water? Know ye not that he was holy? But notwithstanding he being holy, he showeth unto the children of men that, according to the flesh he humbleth himself before the Father, and witnesseth unto the Father that he would be obedient unto him in keeping his commandments. 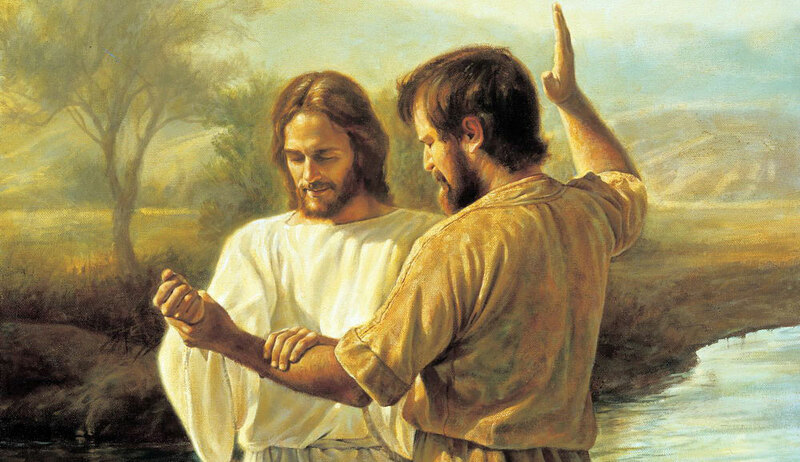 2 Nephi 31 records Nephi’s explanation of the purpose behind Jesus’ baptism, an event that Nephi had previously foreseen in vision (1 Nephi 11:27), in an attempt to expound “in plainness” upon “the doctrine of Christ” (2 Nephi 31:2–3). Although the ordinance of baptism is prominently featured in the New Testament, the precise purpose and meaning of baptism is left relatively vague. In the Book of Mormon, however, the reasons for and necessity of baptism by water are made abundantly clear. The purpose of Jesus’ baptism, as foreseen and understood by Nephi, serves as a model for baptism throughout the rest of the Book of Mormon narrative. The Book of Mormon has a third, and very important, metaphor of the main purpose of baptism. Reynolds demonstrates that for Nephi and subsequent Book of Mormon figures, baptism principally serves as an outward sign or open witness of one’s repentance and commitment to follow Jesus Christ.2 Instead of cleansing from sin, Reynolds notes, “the Book of Mormon consistently points to a different symbolism: the making of a covenant.”3 The cleansing then comes by the purifying fire of the Holy Ghost (3 Nephi 12:2). Indeed, Nephi explains that the reason why a sinless Jesus would need baptism is not for the remission of sins but to publicly witness the making of his covenant to be obedient to the Father. As 2 Nephi 31:7 states, “But notwithstanding he being holy, he showeth unto the children of men that, according to the flesh he humbleth himself before the Father, and witnesseth unto the Father that he would be obedient unto him in keeping his commandments.” In fact, in the ancient world, the swearing of an oath, the bearing of a testimony in court, or the making of a contract or covenant was often accompanied by outward gestures, submission to an ordeal, and the invocation of the name of the god who would attest to its enforcement. Subsequent narratives regarding the ordinance of baptism in the Book of Mormon decisively follow this precedent. When Alma baptizes his followers at the waters of Mormon, he emphasizes the fact that their baptism serves “as a witness before [God] that ye have entered into a covenant with him, that ye will serve him and keep his commandments, that he may pour out his Spirit more abundantly upon you” (Mosiah 18:10). The first baptism he performs, for the man Helam, includes the words: “I baptize thee … as a testimony that ye have entered into a covenant to serve him until you are dead” (Mosaiah 18:13). One of the purposes of the Book of Mormon is the restoration of “plain and precious” truths that have been lost or obscured.5 The teachings contained in the Book of Mormon regarding the purpose of baptism are unique and exceptional in all of ancient scripture for their clarity, specificity and consistency. In contrast to biblical descriptions of baptism, the Book of Mormon provides profound insight into the covenantal nature of this ordinance, what the individual is signaling to God when he or she chooses to be baptized, and the way in which God responds to the believer’s commitment. The Book of Mormon introduces the idea that baptism is the sign that we give to God that we are committed to following Christ and keeping His commandments. Thus, in the sacrament prayers inaugurated by Jesus himself and preserved by the Book of Mormon, we renew our baptismal covenants and witness anew our willingness to keep the commandments that have been given to us (3 Nephi 18:7, 10; Moroni 4-5). The remission of sins comes not simply by being washed in water but by reception of the gift and power of the Holy Ghost, as recognition by God of our repentance and willingness to enter a covenant relationship with him. Because the covenant we make at baptism is essential to our salvation, the clarity that the Book of Mormon brings to the subject is both urgent for all people to understand and also as a display of God's mercy and generosity toward all who have faith, repentance, and humble themselves before Jesus, their Lord. Noel B. Reynolds, “Understanding Christian Baptism through the Book of Mormon,” BYU Studies Quarterly 51, no. 2 (2012): 3–37. Craig J. Ostler, “Baptism,” in The Book of Mormon and the Message of the Four Gospels, ed. Ray L. Huntington and Terry B. Ball (Provo, UT: Religious Studies Center, Brigham Young University, 2001), 139-57. 1. Noel B. Reynolds, “Understanding Christian Baptism through the Book of Mormon,” BYU Studies Quarterly 51, no. 2 (2012): 5. 4. Craig J. Ostler, “Baptism,” in The Book of Mormon and the Message of the Four Gospels, ed. Ray L. Huntington and Terry B. Ball (Provo, UT: BYU Religious Studies Center, 2001), 144. 5. For more on the loss of “plain and precious parts” of the gospel (1 Nephi 13:28), see Book of Mormon Central, “Were Plain and Precious Doctrines Lost? (1 Nephi 13:26),” KnoWhy 15 (January 20, 2016).